DALLAS, TX--(Marketwired - Mar 20, 2014) - Over 50% of U.S. broadband households now use paid over-the-top (OTT) video services, either subscription or transactional, according to research from Parks Associates. The firm, which also notes 37% of consumers 18-24 say online video is their most important video source, will discuss its consumer research and analysis for online video in the complimentary webcast "OTT Services: Moving from Sideline to Primetime," Thursday, March 27, 1 p.m. CT (11 a.m. PT). "Parks Associates research shows 45% of U.S. broadband households subscribe to a paid online video service, with younger consumers such as Millennials more likely than older consumers to use OTT services," said John Barrett, director, Consumer Analytics, Parks Associates. "In our upcoming webcast, we will discuss the emerging role of over-the-top video and its relationship to pay-TV services." According to the market research firm, online video is one of the most important sources of video among all U.S. broadband households. 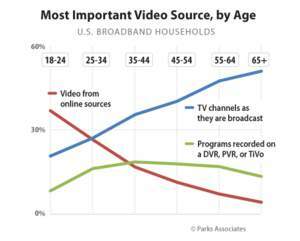 Over 40% of U.S. broadband households selected online video as one of the top three important sources of video, versus 25% for rented DVDs or 13% for owned Blu-ray discs. Online video, OTT services, and pay-TV provider strategies will also be focuses of Parks Associates' 18th annual CONNECTIONS™: The Premier Connected Home Conference on May 13-15, 2014, in San Francisco. The sessions "OTT Services in a Pay-TV World" and "Young Consumers and the Future of Video Services" analyze future strategies for service providers in the video content ecosystem. CONNECTIONS™ Keynotes include AT&T, Cisco, Lowe's, ARRIS, and iControl Networks. Sponsors for CONNECTIONS™ include CEA, iControl Networks, Amdocs, Lowe's, Qualcomm, Arrayent, NETGEAR, PlanetEcosystem, Support.com, Z-Wave, AlertMe, Honeywell, Linear, SmartRG, Ayla Networks, and GreenWave Reality. Press can register for the webcast at http://www.parksassociates.com/ott-services-march2014. CONNECTIONS™ press passes for are available at http://www.parksassociates.com/events/connections-us/media/presspass. complimentary webcast "OTT Services: Moving from Sideline to Primetime,"